I feel bad that this year I won’t be helping out for Thanksgiving at all. I’ll be stuck at work (Don’t worry, I’ll get to my parents’ house in plenty of time for turkey and dressing and football.) The last few years I’ve been in charge of frying the turkeys, yes, plural turkeys, not to mention oven baked ones, at my wife’s family ranch. But this year I have to work so no fried turkey for us. I kept it pretty simple. Injected it with Tony Cachere’s Creole Butter and then rubbed it with Tony’s. Set it on a throne of Fosters and put it on the egg at 350 indirect with cherry wood for smoke (poultry absorbs smoke like a sponge, and cherry is a light wood that compliments it well). 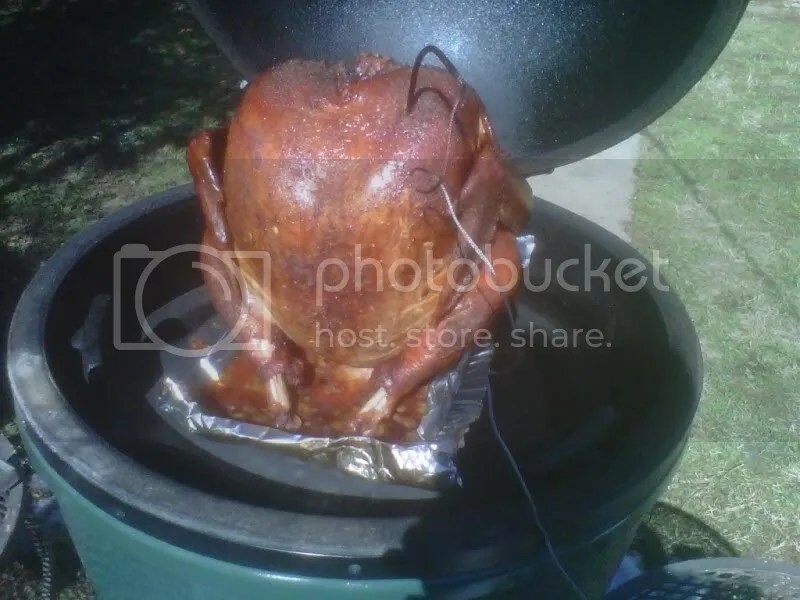 I used the placesetter with the legs up and then made a drip pan out of foil to catch the drippings, more to avoid a mess than any plans for gravy. I was figuring it would take about 15 min a pound, so my 16 lb bird would be done in 4 hours. I was wrong. Took 3 hours. Oh well. Wrapped it up in foil, placed it in a cooler with some towels and made the long trek of about 4 blocks to my buddies house. Everybody raved about how great the turkey was, saying it had great flavor and was so moist and juicy. I even had a guy tell me that he hated turkey but that he really liked mine. So I guess it was a success. I was a happy man, but to tell you the truth, I still prefer fried turkeys. Previous: Previous post: Shrimp On The Barbie! Very cool. 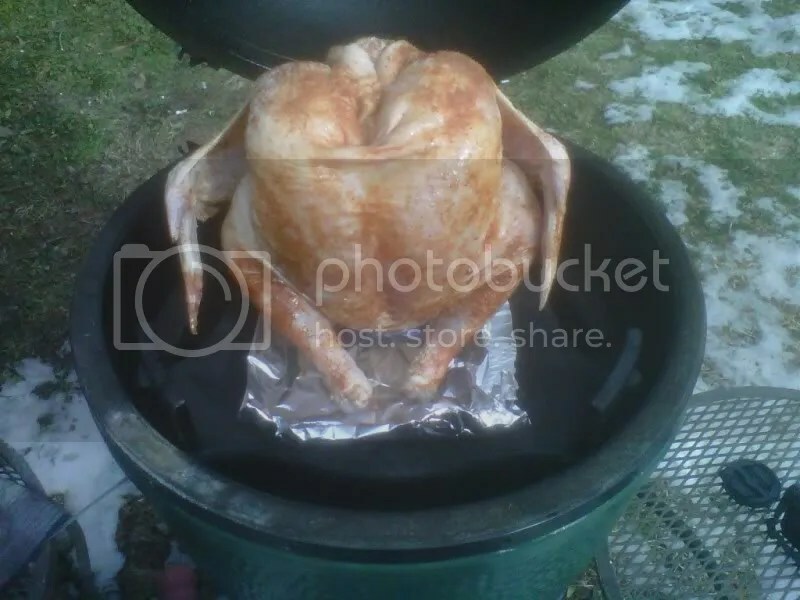 I never thought about grilling a smaller or larger bird stuffed with a can. Fried turkeys are the best though. I agree. I love fried turkeys, but they can be messy and the oil ain’t cheap. My wife got a free turkey at Publix for getting a flu shot. I’ve been wanting to try the beer can turkey. Do you use the ceramic base or a metal stand? Are you still high on the Tony’s Creole Butter? Is there anything else you are interested in trying? I actually did not use a stand at all. Just the can and used the turkey legs to form a tri-pod of sorts. Still like the Tony’s Creole Butter. Used it again, in fact, back in July. I’m always interested in other ideas, do you have any? I was thinking about doing a brine, but don’t really have the time on this bird. But, tis the season for turkey so I’ll think about it and try something new over the coming months. It should be ok without a brine. Just remember to cook to temp not time. What is the finish temp, and do you have the thermometer in the thigh or breast? You want the breast to reach 165 and the thighs to be around 180. 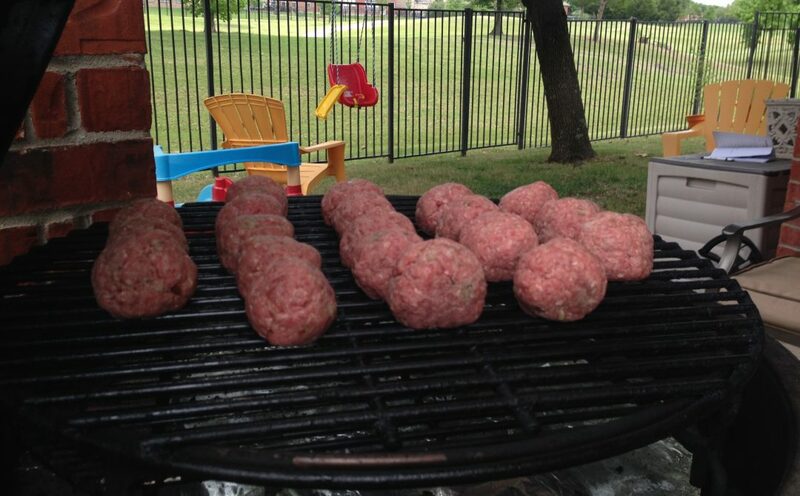 I generally pull it when the breast reaches 160 and let it rest for 30 minutes and the temperature will coast up to 165.